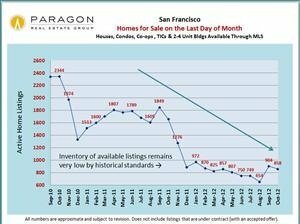 Last month’s newsletter mentioned anecdotal word on the street that the San Francisco market might be slowing down a bit – it appeared the frenzy had diminished somewhat and that fewer listings were selling instantly with ridiculous numbers of competing offers – and the question was whether this would soon show up in the statistics. It hasn’t. Though September did see a burst of new inventory that temporarily changed the equation between buyers and inventory, now with October’s statistics it’s clear the market is still dominated by a high demand/ low supply/ upward pressure on prices dynamic. However, it should be noted that there is a difference in market heat between a listing receiving 1 or 2 offers compared to it receiving 5 to 20 offers, however that difference might not show up in the statistics as long as one good offer is accepted. 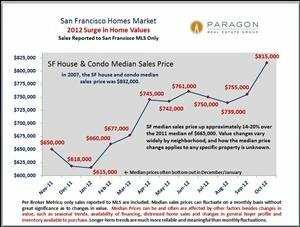 Comparing September-October sales reported to MLS with the same two months in 2011, SF dollar volume home sales were up 41%; at Paragon, our sales were up over 109%. These are not the signs of an ebbing market, nor are the statistics illustrated below. 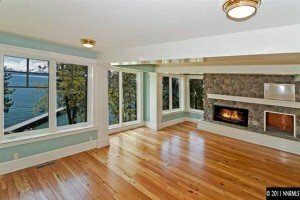 Typically, at this time of year, the number of new listings begins to markedly decline in preparation for the slowdown that usually begins at Thanksgiving and runs through mid-January. But we saw very little of the usual summer slowdown this year, so we will see how much market activity slackens during this year’s holiday season. The median home sales price is that price at which half the sales occurred for more and half for less. It is a very general statistic and big monthly fluctuations, such as seen in October, should be taken with a grain of salt until substantiated over the longer term. Still, October saw a very large increase over the relatively static median prices seen in the previous 6 months, which followed the big jump in early 2012. Remember that sales prices reflect accepted offer activity in the 4 to 10 weeks prior. The average price is simply the total dollar volume of sales divided by the number of sales. 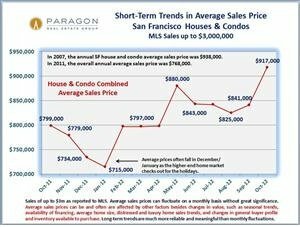 Like median price, it is a general statistic affected by a variety of factors and often fluctuates without great significance on a monthly basis. 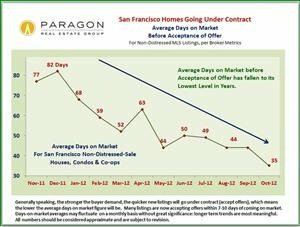 Among other factors, a decline in distressed home sales and/or an increase in high-end home sales, both of which are occurring now in SF, can have an outsized effect on average sales price. We will see if October’s big increase is sustained in future months or is simply one of those anomalous fluctuations which occur in real estate. 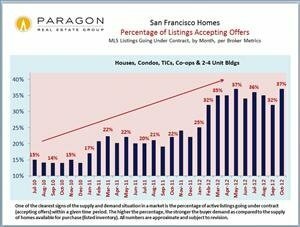 The percentage of listings accepting offers in October was probably about as high as it has ever been, close to twice the level of October 2011. 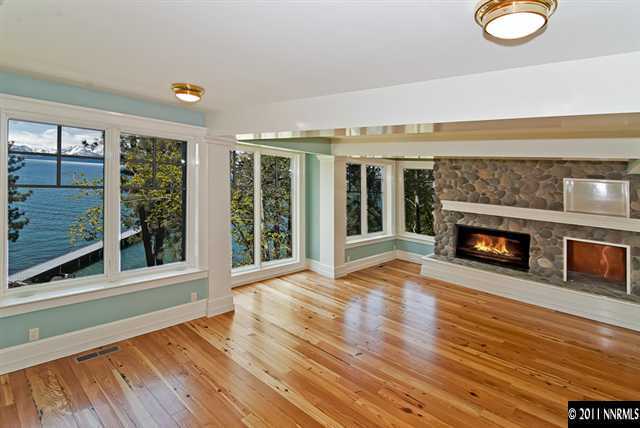 The decline seen in September was the result of a large influx of new listings hitting the market in mid-month. 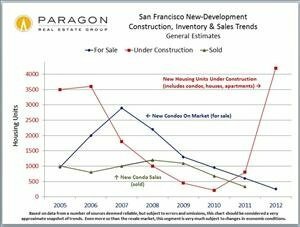 After crashing in 2008, developers are building again in a big way: over 4000 housing units are currently under construction in San Francisco, with many thousands more in the planning/permit phases. 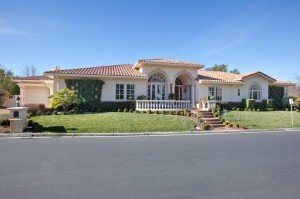 The lack of new homes on the market in the past few years has greatly impacted the supply side of the supply and demand equation. However, with the significant time lag between construction beginning on the larger projects and new condos arriving on market, the effects of this building surge will be a while before being felt. 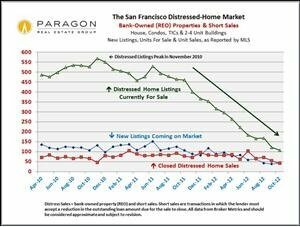 The city was never as hard hit as many other areas by distressed home sales (bank-owned and short sales), and now they are declining rapidly with the market recovery. The number of distressed home listings has declined by 80% since it peaked in November 2010. On this course, this segment will soon be only a negligible part of the SF market. After the spike in September from the large influx of new listings – September is typically the month with the greatest number of new listings – the number of homes for sale is declining again and will almost certainly continue to do so until early 2013. 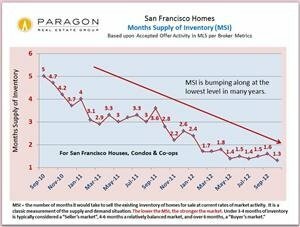 MSI is a measure of how long it would take to sell the current supply of listings at the existing rate of sales. In October, it was about as low as it has ever been. Strong buyer demand plus low inventory typically leads to lower average days on market, and this is what occurred in October. 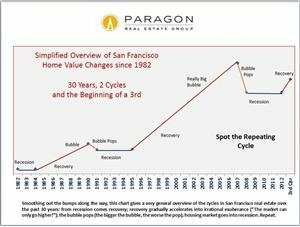 Pulling back from monthly data to look at the longer term cycles of real estate gives greater context to what’s happening in our current recovery. In October, we completed quarterly updates for San Francisco’s luxury home market, the SoMa-South Beach condo market, the Noe Valley-Castro-Cole Valley home market, as well as for many of the city’s other neighborhoods. If you would like to review these analyses, please reply to this email with your specific request and the information will be sent to you. 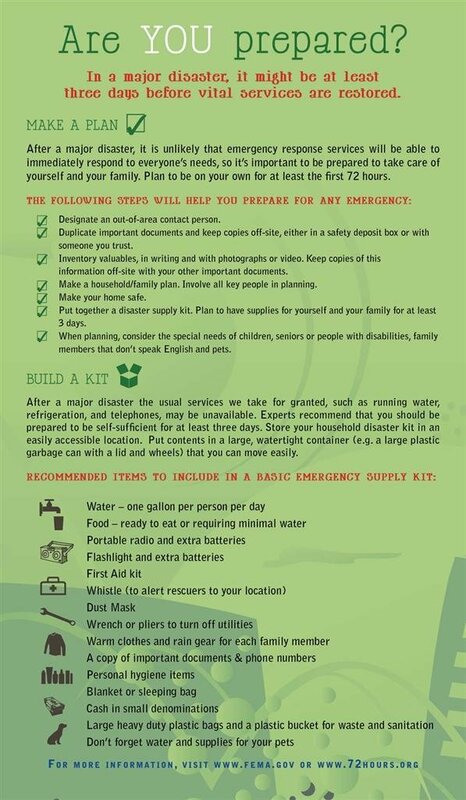 Natural disasters are something nobody wants to think about, but a little preparation can make all the difference if one does occur. The website www.72hours.org provides a wealth of useful information.